On Wednesday, Samsung plucked in another feather in their name. 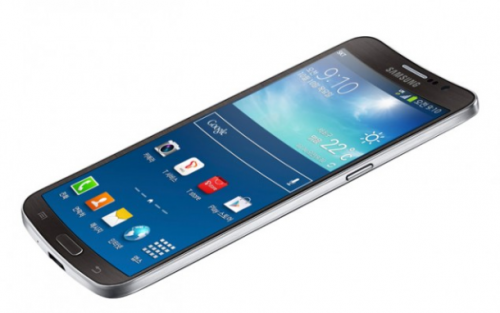 The Samsung became the first electronic giants to launch a smart phone with a curved screen. It is regarded as a variant of the Galaxy Note that will be marketed down the Asian market. The Samsung through “Samsung round” smart phone aims in bring in wearable device which will unbreakable also. There was huge expectations surrounding this device, and like any other hyped device, the smart phone also flashed some news earlier than its official announcement. The curved designed device from Samsung is like an alarm sent from them against their strong competitors namely Apple inc. and LG inc. The Samsung giants for some months were held backwards in their high end mobiles, so with this creation they are again back in the war to compete with the big goons in specs and design outlook. According to the official spokesperson of the Samsung, the Samsung round was designed to make smart phones that will be flexible and at the same time unbreakable. Without saying much about the device, the Samsung official told that the smart phone, Samsung round, is significant smart phone designed by them, and that they do not have much of the requirements to build in second lot as of now. When speaking of features, it can be honesty said, that the smart phone, is basically targeted that how much the users will appreciate the Samsung’s curve screen idea. The device has many features missing. It is no way a very symbolic device in terms of the key specs that it has to offer. The smart phone comes in 5.7 inches screen display. It has a slightly curved screen and weighs lighter than that of the Samsung Note 3. The design can be well apprehended that it will be easier to grip and will not easily slip off. To speak of the key feature, the smart phone, Samsung Round, comes in with a tilt function. This is definitely smart move, through which the Samsung has been able to give the users the facility to check missed calls and messages and even battery status without going to home screen. The tilt option also allows the function to navigate through the media files by just scrawling left and right of the button without getting into the home screen. As of now the Samsung round will be only available to the users of South Korea. Whether the device will be available to other places or not, is still under covers. The Samsung Round is said to be available in luxury brown color in South Korea. The phone is expected to come in with 2.3 GHz quad core processor. The Curved screen Samsung round will be having 3GB RAM and an internal storage of 32 GB. There are expectations that camera will be of 13 mega pixels and will be packed with the same software from Samsung mobile. It seems from dimension wise, one can easily compare it with the latest released Note 3. The curved look will open up new avenue of competition as it would face stiff competition in the high end market from the other electronic giants. It is expected to make some changes in the slowed down market of Samsung in the Asian circle. The Samsung has released their galaxy gear which holds a flat screen, but the company is in high hopes to modify the technicalities and outlook if the curved design of the Samsung round is appreciated by the people. The rolling out of Samsung Round in the market will bring in search for the technology firms in support of finding cheaper spare part options to the available parts in the device. The battery is also something to think about, as though the screen is curved but the battery is of standard shape of flat smart phones. So whether the device needs a uniquely designed battery support or nor will be tough challenge for to answer. The Samsung will face again heated competition as the LG are almost geared up with their vertical curved smart phone, which will roll out on the first weeks of November. LG was hear further making confirmation that they are already in the process of commercial production of curved shaped batteries to support their vertical curve smart phone. The Samsung Round , is quite a huge challenge device built by Samsung, and it is priced at $1,013 , will be available only in SK Telecom carriers.